Starbucks in a former Little Chef building. The old joke that there's a Starbucks on every corner in London may not be quite true, but they've got a pretty good coverage by the side of the road. Starbucks is one of the world's most famous High Street brands, striking a balance between a premium image and being popular. However by the time Starbucks was introduced to the motorway network, the industry was already dominated by Costa. The prices charged at Starbucks are set by the franchisee, and on the motorway these tend to be heavily inflated. The fact people continue to pay may explain why so many Costas have opened up near the motorways. All Welcome Break sites include Starbucks units that are open 24 hours. In May 2006 Starbucks was introduced, under license by Welcome Break, to Corley and trialled alongside Coffee Primo. The result was not overwhelming and motorway users were given the impression that this was as far as the trial would go. 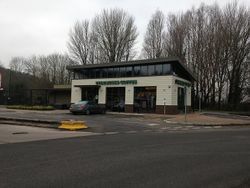 The Corley site didn't close though, and in 2009 Welcome Break opened a new Starbucks at Warwick southbound, followed shortly by an announcement that it would be rolled out nationwide. The few years spent in limbo were enough for customer demand, and Welcome Break's priorities, to change. Around the same time, all of Extra's newest services opened with a Starbucks. Starbucks then became a Euro Garages partner. As Euro Garages became more successful, Starbucks spread further, especially on the a-roads. Many former Little Chefs had become Costas, but with Euro Garages on board they became Starbucks instead. In January 2017, Euro Garages purchased Little Chef with the intention of replacing most of them with Starbucks. In August 2012, Welcome Break opened two drive thru Starbucks units, utilising former buildings at Fleet and Membury. 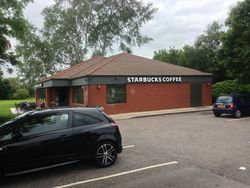 At the time they were the only drive thru's on the motorway network, and one of few examples of Starbucks drive thrus in the UK. Owing to their popularity more have since been built, with purpose-built glass restaurants springing out on spare land owned by Welcome Break's car parks. Starbucks on the Go are Starbucks' coffee machine brand, much like Costa Express. They are currently available at several Euro Garages sites. During mid 2018, Welcome Break started introducing Starbucks on the Go machines to some of their sites to replace Costa Express.